Roberto Nosetto’s office is Italian-modern. One filing cabinet – black lacquer. One desk – no drawers. Carpet – beige. Six hanging pictures – all racing Ferraris, all frameless, all glass-covered. And Nosetto himself is Italian-chic. Always in green, always wearing big-cuffed trousers and small-collared shirts. Jody Scheckter is in baggy corduroys and hand-out Ferrari jacket. About the classiest part of his act is his briefcase, and this he always tells you about. It has these great combination locks, with special compartments for all his credit cards – and it has zipped-up pockets in the back. A work of art, Scheckter calls it. Gilles Villeneuve doesn’t carry a briefcase. Instead, he whips on the handbrake of his Ferrari 308GTB and does a Waldegaard turn into the parking lot. He steps quietly out of the red car and suppresses a smile as he opens Nosetto’s door. “Three and a half hours from Nice,” he declares. “What kept you,” asks Jody. They are here for a Grand Prix collaudo – the Italian word for “prepare”. It’s used routinely in the Ferrari man’s vocabulary. The phone will ring in the Scheckter’s Monte Carlo apartment and it will be Piero Lardi, asking Jody to be at Fiorano on Tuesday for collaudo. Scheckter will know that there will be no tyres to try, no records to break. Rather, he will be driving the cars slowly, checking gear ratios, bedding-in pads. It is a routine precaution – one that was adopted in the Lauda days. It gives you your confidence from the beginning of Grand Prix practice. Scheckter will leave home at nine o’clock French time and will arrive at Fiorano three hours later. He will average 88 mph for the journey, which points to the performance of his chocolate brown Ferrari 400GT automatic – and also the autostrade that help him. Jody will spend most of the trip braking heavily behind meandering Renaults, behind smoking trucks, and he will drive precisely, with both hands on the wheel and thumbtips poised over his special airhorns. He won’t be keyed-up about the day ahead. It will mean absolutely nothing to him – another day, another car to test. He will think about the last race, and about the next race and about the latest in Michelin tyres, but mostly he will be thinking about his standing as a professional, about his idea of what a professional should be. He will be wondering if he did the right thing in buying those bonds. Or if he should be organizing the drivers more in matters of safety. They need a leader; and, now that Jackie Stewart has retired, someone has to lead them. He will be thinking about his next flight connection – whether it will be better to stay put for a few hours and get the direct flight or whether he should rush away to get the connection to Paris. His secretary can sort that one out – or can she? Better check tomorrow morning. Anyway, how would Jackie approach the problem? That’s the key question. Scheckter will not, in short, allow an element of romance into his racing life. He’s there, in his Ferrari, driving to Italy to test the Ferrari Grand Prix car, but he could just as well be on the A413 to Silverstone. He’s not – which is nice, because Ferrari do everything better – but the attitude is the same: do the job. Use the facilities. Test and test again. If he has any doubt, it is about the way Ferrari tests. They’ve got every chance to be systematic and orderly yet, ultimately, it usually comes down to Mauro Forghieri trying four rear wings and Michelin six new tyre types. At the same time. And Michelin are secretive. They’ll tell you you’re running a new front in a new compound but they won’t tell you how it fits in with the others. Then there’s the language problem. Mauro will translate the testing notes but in the middle he’ll be interrupted and then Gilles will say something and by the time he’s finished then Mauro will have gone for some lunch. “Yeah. Forza,” Scheckter will reply in a monotone. Jody will visit the factory first. He’ll go to see Piero about the schedule and the travel and then he’ll make a few calls. Today, it turns out, Enzo Ferrari is back at work after a spell in bed; and, sure enough, the blue Fiat 132 arrives soon afterwards, with Ferrari in the passenger seat, dark glasses and trademark light raincoat unmissable in the shadows. He is helped into his office by two thick-set bodyguards. Then it is lunch time. If there is anything Italian about Scheckter it is his taste for pasta. Thus there is nowhere else to eat in Maranello than Il Cavallino, the restaurant opposite the factory. It is typically Italian. White tablecloths and bunches of grissini to eat while you’re ordering without the menu. During the meal, waiters will shuffle nervously past the tables and squeeze through sliding doors. Enzo Ferrari is dining, and he wants to be alone in a private room. Alone except for his big-shouldered friends. Scheckter will drink no wine and will saunter into the warm afternoon, still in his normal gear. His overalls and helmet are at Fiorano, so from home he has brought only his flameproof underwear. He spots a few of his mechanics standing by the roadside, using up their lunch-hour. He will drive the mile or so to the test track and ask the man at the gate about his bambini. Then he’ll point the 400 under the flyover and drive slowly into the quadrangle. Offices and garage space on three sides, Fiorano’s pits on the fourth. English teams, eat your heart out. From Nosetto’s office, the two drivers walk to their locker room. Here there’s a TV, VCR and tapes of recent races. Time is running out and overalls must be worn. Jody and Gilles walk to the pits, Jody in his blue Brooklyn chewing gum overalls, Gilles in a brand new pair of silver Simpsons; Gilles’ mechanics gesture accordingly, and Gilles laughs. There are two cars in the Fiorano pits – Gilles’ T4 and a workhorse T3 fitted with lots of additional electronics. Scheckter walks quickly over to the newer car, notices – by way of its copious seat padding and maximum pedal adjustment – that it is not for him, and swears. Why is that his car is the one that’s always late? By the time Scheckter’s T4 arrives, Gilles has his helmet on and is being strapped into place. Around the back, Antonio Bellantani and the boys are lowering the ramps of the trailer and unstringing the latest T4 – and it is here, you reflect, that Fiorano is in greatest need of improvement. The racing department and the test track are separate, and the cars have to be delivered on trailers tied to Fiat jeeps. Better, everyone knows, to have the entire Ferrari racing department moved to Fiorano. Track manager Nosetto says that the move is simply a matter of time. It is also a matter for union consultation, workshop facilities – and finance. Gilles accelerates out of the pits with new brake pads, new engine and new gearbox. Unlike Scheckter, he still feels passionate about the job. Two years ago he was following a route that no-one took the top. Formula Atlantic and a bit of Can-Am. He was a Canadian with a funny name, funny English and a wife and two kids. Now was all that – plus a Ferrari driver. He’d been turned down by McLaren in 1977, and perhaps that had been the best thing that had ever happened to him. Ferrari had signed him instead – and given him more test miles in two years than most drivers managed in five. Today he is not only sure that he is as quick as he needs to be; he has also won three Grands Prix, proved a match for Scheckter and kept his own ways. He has moved his family to France, to a pink-walled villa in the mountains overlooking Grasse. You approach it on a narrow, pot-holed road that moved Gilles into buying a nice, thrashable, Fiat 124 Spyder. You turn right at the bar named Chez Bernard, but if you stop there for a drink you’ll see the poster on the wall: Gilles at Long Beach on full, unrepentant opposite lock. The grounds of the villa are a little over-grown and the rooms themselves a little untidy – but then they are also lived-in. Gilles is pictured these days in the glossy magazines with his track pants and his beach runs but actually knows only one physical sport, and that’s driving. He doesn’t train in the Scheckter sense of the word. Instead he goes out on his 4-w-d pick-up truck and throws it up bits of land at which even moto-cross riders would baulk. He doesn’t lead a briefcased, packaged F1 driver’s life. He eats steak and chips, drinks a lot of milk shakes and soaks himself in racing. He’ll drive into town at the absolute ten-tenths maximum, spinning wheels at every traffic light and using the handbrake where there’s no power to boot out the tail. Wife Joanne will sit there impassively; son Jacques will laugh his head off. Gilles want to buy a good, well-finished Shelby Cobra and – for the Fiorano trip – he also owns a Magnum-spec 308GTB. A truck ran into it the other week, so Gilles applied some sound, Canadian panel-beating: he punctured the damaged door with a spike and levered it back into place. At Fiorano, on today’s trip, he’ll leave the car for repairs. Last year the Villeneuves used a giant camper for the European races. They towed it up the pot-holed road and then spent six and half hours manoeuvring it into their driveway. Gilles has since fashioned some special pivot blocks for the operation, so now there are no qualms about taking it there and bringing it back. At the circuit, anchored near the Ferrari trucks, it provided a quiet, carpeted base for Gilles and the family. Jacques and Melanie could watch the race from the roof; Gilles could go to sleep early and be up early, with no traffic about which to worry. The only problem is their next door neighbour in Grasse: she raises hell about the damn caravan that ruins the outlook. The afternoon is crammed with ten-lap runs and longish periods of silence. Villeneuve comes in, Scheckter goes out. In between time, the bedded pads are changed and gear ratios are discussed. Forghieri, in suit and tie, consults his assistant, Antonio Tomaini. Nosetto rushes from pits to office, answering phone calls. There’s a loud buzzer in the pits, but you can only talk effectively from the office. A fire truck, with suited drivers, waits by the pit exit. And Enzo Ferrari’s fiat 132 is still parked by the office adjacent to Nosetto’s. He’s in there, preparing for a drivers’ meeting later that afternoon. Villeneuve goes out in the workhorse T3. It’s wired up with sensors to measure tyre temperatures, engine temperatures and rear wing pressure – and, as well, it is fitted with Ferrari’s automatic gearbox. Well, semi-automatic. There are two buttons on the steering wheel – one for upchanges, one for downshifts. Villeneuve accelerates out in first, the revs soar in neutral – and he trickles slowly round to park the car in the pits. “Transmission problems”. The meeting, held at the conclusion of testing, is between Il Ingegnere himself (Enzo likes not to be addressed by any other title), Forghieri, Piero Lardi and the two drivers. They discuss recent performances, Michelin tyres, handling and pit work. Scheckter attempts to drop the hint that he would like more power from the engines – and Villeneuve, who knows Il Ingegnere better, quickly changes the subject. Strangely, perhaps, the exotic closed-circuit TV cameras are little-used. This has been a collaudo, which means that no records have been set – but, even so, the gadgetry has seemed a little superfluous. Perhaps it will be more important when the drivers are out testing tyres. When they next attempt to break 1min 8.5sec – the lap record that currently stands with Villeneuve. At six o’clock they change out of their overalls and make plans for the return trip. Gilles is now without a car, so Jody will take him to Monte Carlos and lend him his Fiat from there. They’ll stop at Il Cavallino to pick up some fruit. “Well, that was a good day’s work,” says Scheckter as he drives out into the Modena rush-hour traffic. “We seemed to get a lot done.” He curses as he gets stuck behind a truck that wants to turn right. Sweeping south, with light rain pelting hard at 120 mph, Scheckter and Villeneuve are the perfect team-mates. Gilles starts playing with all the switches, including the gear selector, while Jody over-reacts to the traffic. If there is any rivalry, it is in their not taking advice from one another. A few minutes later, the 400 coughs, coughs again and dies. Scheckter slams the selector into neutral, sways the car from side to side and coasts silently down the autostrada. Gilles fails to suppress a laugh. Scheckter being Scheckter, the Ferrari comes to rest besides another parked car – a French-registered Fiat. Gilles saunters round to ask the man about his puncture – and returns with a fuel can, much to Scheckter’s delight. We drive away again, with Scheckter remarking smugly that we should have pinched the man’s wallet, too – just for good measure. He is driving quickly on a wet road but Gilles sits back in comfort and begins to doze off. Keeping him awake are busts of braking and incessant requests for new cassettes. We are now on the dual carriageway that runs parallel to the coast from Ventimiglia to Nice. Tunnels through the mountains every minute or so. Concentration required, even for Scheckter. Two-thirds through one of them we see a flashing light. There is a truck on our right and a parked car – in front of a police car – on our left. We are doing 120 mph – and Scheckter hits the brakes hard. They lock and he hits them again – hard – but suddenly there is no more room. Scheckter flicks the wheel, makes an apex of the left-front corner of the truck and slides through the closing gap, hands correcting the slide in both directions. We are still travelling at over 90 mph. In the Ferrari, Villeneuve has done nothing or said nothing, which is as big a vote of confidence as Scheckter is ever likely to receive. You can sense, though, that this had been a Big Moment, even by their standards. The trip was slower after that, but we reached Monte-Carlo soon enough. Scheckter parked the 400 underground and trudged up to the elevator carrying his briefcase and underwear plus a supply of Ferrari scarves. Gilles carried his trackbag. It was 11 o’clock, and it wasn’t time for dinner, but Pam Scheckter was waiting anyway with beef casserole and salad. Scheckter lives on the top floor of a giant block of flats (overlooking the Holiday Inn) and isn’t short of space. He has his office on the first floor and he even has a roof garden. In his living room he has his Sony tape equipment and his weights and bars. About the only thing missing is Jackie Stewart’s Guide to the Modern Racing Driver. Gilles made it back to Grasse but had to drive slowly all the way. It was past midnight when he arrived, the Ferrari driver at the end of a Ferrari day. And he slept soundly, deep into the following morning. Author’s note: And the friendship continued. 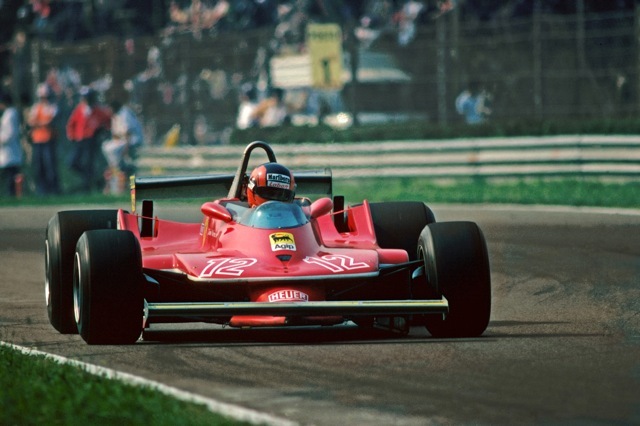 Even though he was still in the running for the Drivers’ Championship, and was under no team pressure to do so, Gilles told Jody at Monza that he would drive the rest of the season to help his friend; Jody duly became the 1979 World Champion. The pay-off, Gilles always believed, would be in 1980, when Jody would drive to help Gilles. In 1980, though, the Ferrari was a disaster. Gilles never came as close again to becoming World Champion. Great story, what an honor to spend the day in the presence of such greatness. Alas no comparison to today’s F1. Great reading, thank you Peter. These kinds of stories make me realize what an adventure F1 was about back in 70’s/80’s before the modern days of squeaky clean F1. Looking forward to hearing more stories. Fantastic reading! What an experience for the readers, wow! Brilliant story. I love the detail in your reports/blogs.